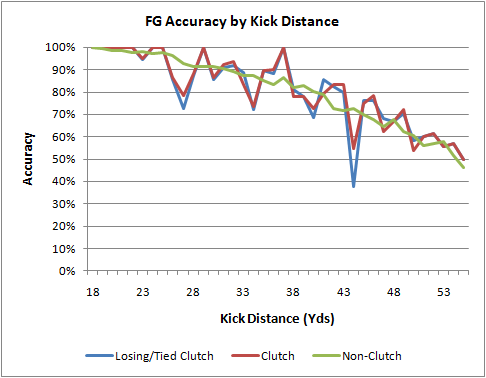 Advanced Football Analytics (formerly Advanced NFL Stats): Does FG Accuracy Decline In Clutch Situations? Like most other Baltimore fans, I was disappointed at the end of the most recent Ravens game when kicker Steve Hauschka missed a 44-yard field goal that would have capped a dramatic comeback. What made it worse was that I had to suffer through the usual nonsense from the local sportswriters about how Matt Stover, the popular long-time Ravens kicker until released this year, would have undoubtedly made that kick. The jury is certainly still out on whether Hauschka is any good, but let's keep one thing in mind. NFL kickers as a whole only make kicks from that distance 70% of the time(including blocks). We simply don't remember all the missed field goals in the first quarter, or when our favorite team is already 17 points ahead or behind. The ever-clutch Stover? His career accuracy from that range was...70%. But then I wondered whether FG kickers are affected by the game situation. Do their nerves get rattled? Are kickers less accurate in clutch situations when the game is on the line? I defined clutch as when the score was within 3 points and there was less than 3 minutes left in regulation time, including all overtime kicks. I also defined a second version of clutch as when the kicking team was either tied or losing by up to 3 points. This second version is intended to account for the possibility that a kicker's nerves aren't really affected when his team already has a small lead. The average FG accuracy for non-clutch kicks was 83.3%, but it was 81.1% and 80.7% for clutch and clutch(losing/tied) respectively. But those numbers are misleading because clutch kicks tend to be longer. Teams kick field goals where they otherwise wouldn't--when they are desperate for 3 points and time is running out. The median attempt distance for non-clutch kicks was 35 yards, but it was 37 and 38 yards for clutch and clutch(losing/tied) respectively. We should expect slightly lower accuracy for clutch FG attempts due to their longer distances. We need to break out the accuracy by attempt distance. The accuracy for each kick distance is plotted in the graph below. These are all FG attempts from the 2000 through 2008 seasons. There were 8,060 non-clutch kicks, 590 clutch kicks, and 534 clutch kicks when losing or tied. The green line is non-clutch. The red line is clutch, and the blue line is clutch when losing or tied. The clutch lines are noisier than the non-clutch line, but the result is visibly clear. There is no noticeable decline in accuracy for either of the definitions of clutch. Oddly, there is a black hole (or Bermuda Triangle) right at 44 yards, exactly where Steve Hauschka missed his last kick. There happens to be fewer examples of clutch kicks from that distance than others for some reason, and we should expect a good deal of random variation. But whatever the cause, if there is one, kickers have been less than 40% accurate when the ball is snapped from the 27 yard line in clutch situations. While it appears that pressure doesn't affect NFL kickers as a whole, we still don't know whether some individual kickers are truly good or bad in the clutch. Unfortunately, because kickers typically only have between 30 and 40 attempts a year, and only two or three could be considered clutch, we'll never be able to know. Sure, some kickers will be end up appearing better or worse in the clutch, but that will occur just by chance, just like some kickers will randomly appear better than others in any subset of conditions. We'll never have the sample size to know with any confidence whether the effect is real. "The median attempt distance for non-clutch kids was 18 yards, but it was 20 and 21 yards for clutch and clutch(losing/tied) respectively." I don't think that sentence is accurate. Could it possibly be 38, 40 and 41 yards? Right. Thanks. That's the line of scrimmage for the kicks, not the kick distances. That's how my database lists them. It should be 35, 37, and 38 yards for the median kick distances. I'll correct it above. if you had the data couldn't you look at total career clutch kicks and determine retrospectively who the best/worst clutch kickers were? If the best kickers are in the league for say, 15 years (selection bias, i know), your numbers would give you a sample of ~30-45 clutch attempts each for at least the most durable of kickers. Not a huge sample but enough to do a hypothesis test and look for significant differences, no? Something tells me you'll find at least a positive bias in the success rates for these "survivors" against the league avg. Maybe even a few that are significantly below average, which would be curious. Now, if you could only disprove that "icing" the kicker was a useful tactic. Interesting. A study in Chance magazine ten years ago found that the success rate for lead-changing kicks was significantly lower than non-lead-changing kicks. As for icing the kicker, the research is mixed. This is inline with my similar reading of "clutch" players in other sports. I'm sorry that I don't have the time to search for and provide reference links, but I know that the sabremetricians have largely debunked the theory of a "clutch hitter". Similar studies in basketball have debunked the theory of a "clutch shooter". I think the definition of "clutch" is "all the special times in my mind that I conveniently remember, disregarding all the contrary evidence that I have conveniently forgotten". Perhaps the hole at 44 is because the kickers know it's not an easy kick, but they also know that they are definitely expected to make it. Farther out they don't feel that expectations are so high so the pct goes back up to the non-clutch value. 'Clutch players' also tend to acquire their moniker based a lot on situations totally unrelated to the game. For all intents and purposes, a 40 yard field goal attempt in week 1 of the season should be no different to a 40 yard FG attempt in the Super Bowl. Similarly with QB late game TD drives. Perform one in the Super Bowl and you're "Mr Clutch". Perform one in Week 1, and you're just some random QB. The pitch is the same size, the ball is the same, but because of media interest you are judged to be clutch if you play well in big games. From a statistical view, how a player performs in a given game is really just a random variable, so the title of clutch is more a case of what dice rolls came up on a big day. A field goal kicker can be no more 'clutch' on game winning kicks than a captain can be clutch at calling the coin toss for overtime. That would affect 43 and 45 yarders as well. Small sample size random variation. I would be surprised if there wasn't at least one unexplained bump on the chart. "He missed one earlier in the game...so how much confidence can the coach have..."
There is all sorts of bs regarding kickers. For projections, you can basically assume that all NFL kickers are the same and you won't be far off. If the average success rate at some distance is p, then the RMS uncertainty in the success rate is Sqrt(p*(1-p)/N), where N is the number of attempts. It might be helpful to plot those uncertainties (excel will do it for you) and see whether the black hole at 44 is statistically meaningful or not. I suspect you'll find the answer is: not. Or, if I might venture a guess: were there about 20 kicks from 44 yards in the clutch/losing sample? it seems like where the kick is on the field left-middle-right should also matter. i dont think you can discount the angle. id be willing to bet that, that dip in the graph would be due to the angle it is kicked at. also: what about wind stats? or stats on the amount of times the defense pushes through the line but doesnt block? or times when a player comes around the edge of the o line? it seems like these may be contributing factors. To add one more to ric's list of factors to consider: bad snaps. Do you have any stats comparing accuracy of soccer style v. straight-on kicking in the NFL? Angle shouldn't matter too much. At 44 yards, the goalposts "shrink" by about 4 inches when kicking from the hash. Would matter most on very short kicks (20-25 yards), but still has little effect given how close the kicks are. I also think angle wouldn't matter since teams don't go out of the way to get the ball in a certain spot to kick during normal play.